Our folding desk legs are ideal for schools, universities and exhibition contractors, or anywhere you may need a compact table you can store easily. 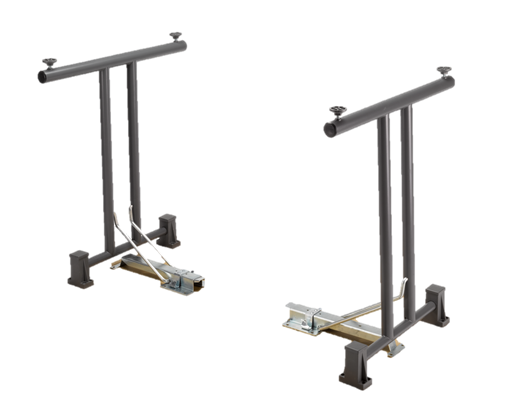 Our legs are a standard straight leg design and come complete with all required accessories, including plastic stacking buffers. Height adjustable from 710 to 715mm, these legs are T-Shaped have a base footprint of 598mm. Due to the strong sturdy construction, these frames are suitable for a variety of size desk and worktops but please note the minimum length worktop to suit these legs is 1500mm, and the minimum width is 600mm. , although you can also buy the legs complete with tops from ourselves - please ask if you don't see the listing? Manufactured in a couple of finishes as standard from 35mm diameter tube, you get a pair of legs to assembled 1 complete desk or table and the boxed set comes supplied with all the necessary fixings and accessories.